All ingredients are plant based, meaning everything is vegan friendly. 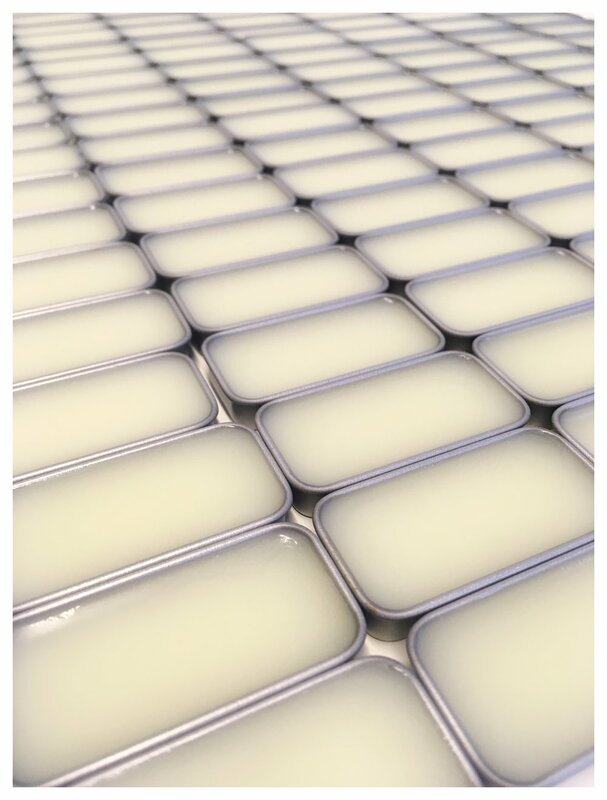 Once everything is melted and liquidy (high techy term) we add the more sensitive ingredients at a lower temperature; including the Vitamin E oil and the Vanilla Oil. Our lip butters are packaged in super cute retro slide tins –see them here all laid out waiting to be filled. The tins are a handy 10ml size, which fit snuggly in your pocket, handbag or basically anywhere. They can also be re-used when empty - no plastic here! We hand fill the lip mixture using this nifty device. It speeds things up a wee bit (alas, not nearly as quick as this video tho..) and creates less spillage than using a jug. Once all the tins are filled, they‘re left to sit and chill out for a bit. Their lids can’t go on until the mixture is set. Check out the process here… don’t worry, we’ve sped it up for ya. Watching it in real time would seriously be like watching paint dry, right? The final and finishing touch is a batch number & best before date.